As a huge fan of home-invasion movies it was so good to see something that didn’t follow the typical set of rules we usually get with the sub-genre. 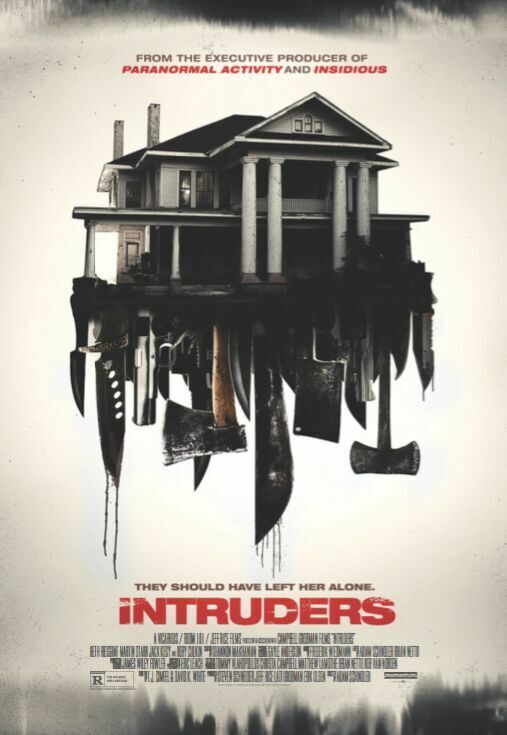 Intruders is much more than a home-invasion movie, in fact it cleverly blends a lot of genres, touching on mental illness, revenge, siege and some other twisted elements that I would rather not say as I feel best for you to witness it by yourself. Intruders doesn’t take long in establishing the plot, with the main story ready to rock at roughly 13 minutes into the film. Our main character, Anna, suffers from severe Agoraphobia and has not been able to leave the house in years. When her brother dies of cancer, she is at a loss, she has no idea how she is going to continue without him – he is all she has known and trusted, and now she must learn how to cope by herself. When a local carer, or meals-on-wheels guy (Rory Culkin) befriends Anna, he learns that there is an undisclosed sum of cash hidden within the walls of the house, it doesn’t take long for the news to spread to the wrong people. When the funeral of her brother is taking place – this is when the Intruders decide to strike. But Anna’s illness is so bad, her fear of the outside world has crippled her mind so much she was unable to attend the funeral of the only person she loved. This is bad news for the Intruders as they thought they could get into the house, steal the cash, and get out while she is burying her brother which results in them taking her hostage. What these guys don’t know is what Anna is capable of when she is pushed, and what the house is capable of doing to break the sanest of minds. So, for the first half of the movie we see the Intruders chasing Anna through this large house, which she obviously knows better than them. The intruders know the severity of her illness and are using that to their advantage, knowing that no matter what goes-down, she is not going to leave the house. The second half of the movie turns the tables and has Anna fight back and take-down the Intruders one-by-one using the house as an advantage, showing us that these guys have totally just fucked with the wrong person. The lead performance from Beth Riesgraf was exceptional, although the other cast, including Rory Culkin (Signs), Martin Starr (Dead Snow 2), all done a fine job at bringing this tale to life – it has to be said that Riesgraf carried the whole movie. Intruders might come across as a film that is trying to do too much, but in order for this to be different it has to add other elements of genres, and there is quite a few packed into its running time. I personally enjoyed the ride and thought it was a superbly made indie horror. It was a fresh and breathed life into a genre, although still a great genre. usually doesn’t think outside the box.